Tarun Gupta March 3rd, 2016 Search Engine Optimization 7 comments. Ever since Google's Penguin algorithm happened a few years back, it left SEOs with no option but to alter their strategies. Eventually, the Penguin update transformed the search engine industry and buried away easy going and con search engine ranking techniques. As black hat started losing due to harsh penalties from the Google, black hat masters coined Negative SEO to win the game. Let me raise you a question. Can you afford to see your website lose rankings just because a bunch of black hat people performed negative SEO on it? You'll answer in negative. It does hurt even if your website gets penalized for a week or a month. Dipping rankings means declining visitor influx and dwindling revenue forecast. Most of the negative SEO attacks are made on your backlinks. Scammers attack your online business by building low quality links or redirects. This is therefore important to know when bad links or redirects are made to your website. You can leverage tools like Ahrefs or Open Site Explorer to manually check if someone is building spammy links to your website. This is another con strategy where spammers try to remove your best backlinks from other sites. They contact website owner of the link pretending being you, and request the webmaster to remove your backlink from the website. To avert any such damage, keep using an email address from your domain while communicating with the webmasters. You may also set alerts to monitor your quality backlinks from being manipulated or altered. Securing your website from hacking and spam is another important task to carry out. Hackers leave no stone unturned to deface your website. You can keep your website safe by using the following: If using WordPress, use login limiter to reduced failed login attempts. Create a strong password that can't be remembered or guessed easily Create regular backups of your files and database on a regular basis. Spammers copy your content and publish it across internet. This mass duplicity hurts website ranking and visibility. If it happens, there would be fair chances Google will penalize your website. Use some free or paid software to check plagiarism on your website. Wow! I had no idea this was a thing. Is there any way Google can punish companies and websites that use these tactics? The only way to save a site from Neg SEO is to become an authority site in google’s eye for your niche, period! That must make it a really hard thing to avoid. Thanks for the great article Tarun! 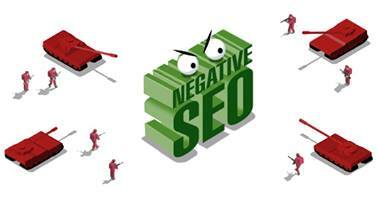 There is no denying the way that Negative SEO exists. We have seen a few sites being a victim of it. The only solution that you have is to watch out for the backlinks and disavow any suspicious links ASAP. Constantly checking your backlink portfolio is still an overlooked strategy, it’s not only negative SEO attacks that might take your site down in rankings, we had an affiliate dumping our link on his farm of hundreds of low quality websites and unknowingly affected our SEO negatively, only after seeing a huge bump in incoming links in Search Console we realized we need to ask him to a) remove the link, b) disavow c) add a directive to robots.txt to not allow bots on the folder that has the affiliates link on our website.